(From Fujifilm lens literature) FUJIFILM Corporation has announced the new FUJINON XF23mmF2 R WR, a compact, weather and dust-resistant wide-angle lens weighing just 180g. The new lens joins the lineup of X Series digital camera lenses known for their outstanding image quality. The XF23mmF2 R WR has a highly versatile focal length (35mm in 35mm format equivalent), covering a range of subjects from snapshots to landscapes and portraits. Its compact, lightweight design and high-speed autofocus (AF) capability allow users to enjoy taking pictures quickly and easily. Compatible with the vented metal hood "LH-XF35-2" (also compatible with the XF35mmF2 R WR). 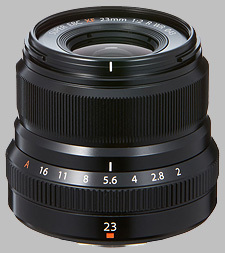 The Fujinon XF 23mm f/2 R WR doesn't have any user reviews yet!